Japanese Conversation and Dialogues F.A.Q. If you are a user and you are having trouble with the app, please check this page for any known issues and then call (1-866-837-3607) or email us for support. Thank you!! If you have any questions, comments, or suggestions, please call us at 1-866-837-3607 (Florida, USA Time) or email us at help@thejapanshop.com. 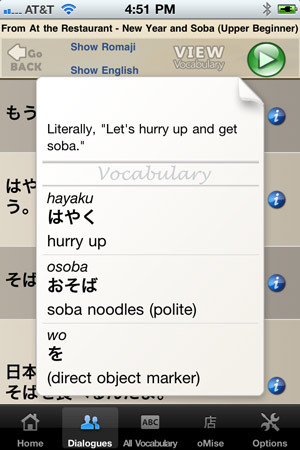 This app allows you to understand how sentences are constructed in Japanese and also to learn vocabulary in context. The heart of the app is the “My Dialogs” section. This main Dialogue page shows all your installed Dialogue Packs. A Dialogue Pack is a group of dialogues in a theme such as at a restaurant, with a friend, or on a date. Since this is a fresh install, only the free dialogues are shown. If you buy a Dialogue Pack (in oMise or tapping “Get more Dialogs.”), you will see it here after downloading. The Free Dialogue Pack comes with 4 dialogues, but each paid Dialogue Pack comes with 7 to 20 dialogues. The default is to hide romaji and English. You can change the default in the Options menu. View Vocabulary shows all the vocabulary in alphabetical order from this particular dialogue. Tap any word there to hear it spoken. The button plays the entire dialogue in order. You can set it to play pauses for repetition in the Options menu. Tap each line to hear just that line. 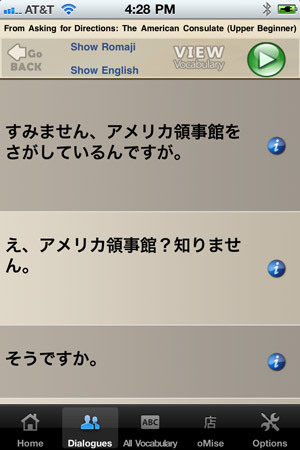 Tapping will show all the vocabulary from all dialogues installed. You can search and tap to hear it spoekn. Right now, that is all it does, but we plan to add flashcards, quizzes, and games to make this section as interactive as the Dialogues section. Tapping allows you to purchase and instantly download other Dialogue Packs. Please check out our selection! Please contact us if you have any questions or if anything is unclear. We will add to this tutorial as we get feedback. Finally, a fun and easy way to learn REAL conversational Japanese. We have been involved with helping people learn (and teach) Japanese for over ten years now through our TheJapanesePage.com (free) website and TheJapanShop.com webstore. We have learned the best way to learn vocabulary–by far–is in context. This app has been designed from the ground up with this in mind. 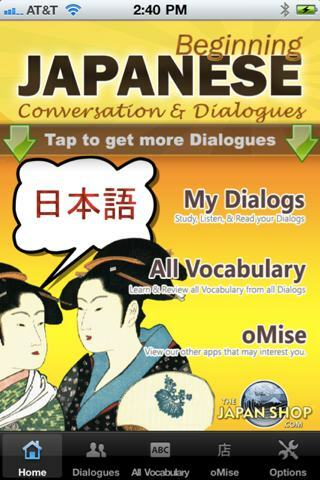 Japanese Dialogues (or Dialogs) and Conversation comes with four beginning level dialogues recorded by native Japanese speakers (male and female) absolutely FREE! Download the app now for no charge to see how amazingly useful this can be. 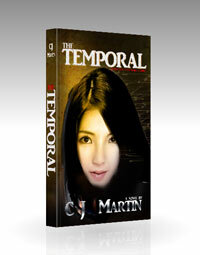 Also, every word in every dialogue is defined and has its own sound files recorded by native voice actors and actresses. Tap a single line to hear just that line. Tap the play button at the top of the dialogue to hear the dialogue read naturally line by line. Set it up so it pauses for repetition after each line. 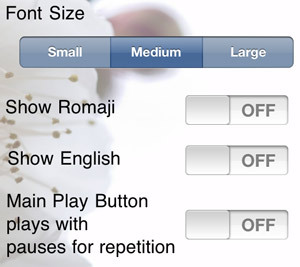 The settings menu also allows you to hide/show romaji and English translations. Nearly every line from every dialogue is packed with cultural notes and hints for correct usage. Just tap the information icon for notes to popup along with every word from that line defined. Just tap any word to hear it spoken. 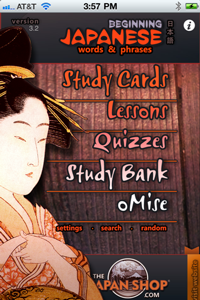 We want this to be a seriously useful tool for learning Japanese! In all, we have recorded over 3,000 sound files for all the dialogue packs! The free dialogues alone have almost 200 sound files! 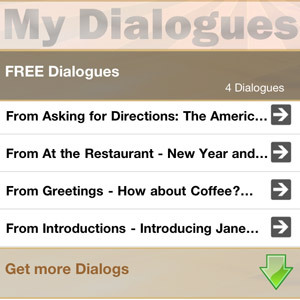 Additional dialogues are available for in-app purchase on topics such as: traveling, at the airport, with friends, out on a date, business phone, and much more. We have tried to offer a lot for a little (most dialogue packs are only .99 and have at least 7 full dialogues and hundreds of sound files). 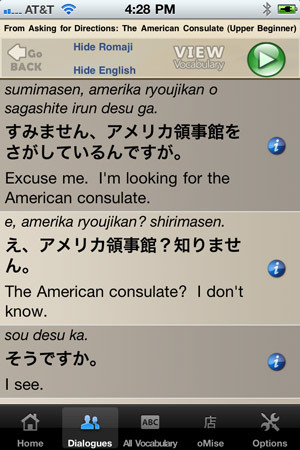 Try out the free dialogues to see if it will help you with your Japanese!